In January this year we attended the National Scripture Use Conference in Ukarumpa. One of the results of this conference was to plan regional conferences for local church leaders. This was the first of the regional conferences to take place. Gertrude and the Regional director, Holly Hong did much of the preparation work for the conference to happen. The theme of the conference was Tok bilong God long tokples i swit moa yet (God’s Word in my language is very sweet). There were times for testimonies of changed lives because of the translated Word. 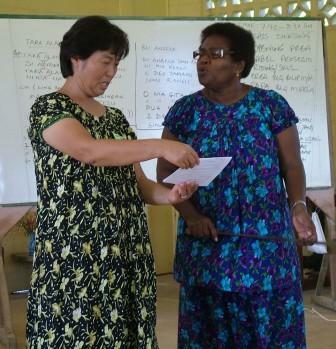 We presented the different areas of training that are available to Papua New Guineans to engage in Bible Translation. There was even a time for open discussion for the church leaders to express some concerns about the translation process and their part in it. I believe most people left with a better appreciation for the need of translation and a better idea of what they could do. Some leaders were ready to sign up people to receive training to be able to start Bible translation.